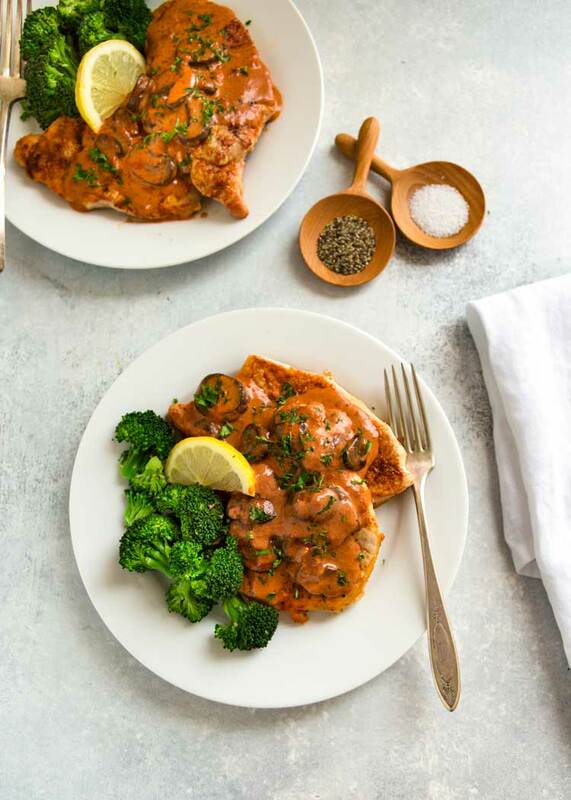 This Paprika Pork Schnitzel is a fantastic Swiss version that doesn’t get heavy with breading, and while traditionally served along side spätzel, a soft egg noodle, this gets the steamed vegetable treatment. What makes this is the sauce. You need this paprika sauce. While most schnitzel usually consists of a meat, wether it be veal, chicken or pork, that gets pounded with a meat tenderizer, gets breaded and then is fried. 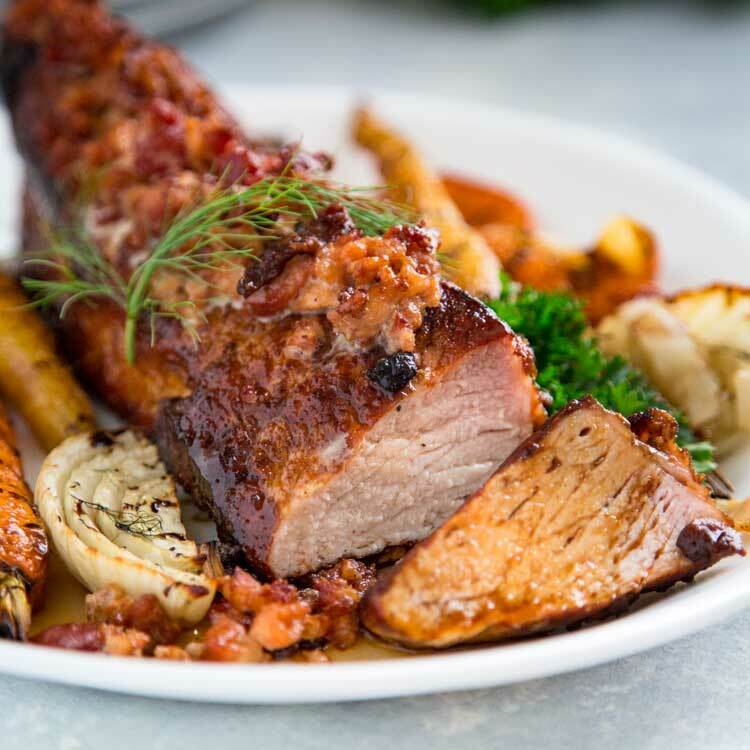 This version starts with half-inch thick pork loin meat that is seasoned with salt, white pepper, paprika and a dusting of flour. This comes together quickly and the sauce is out of this world good. Schnitzel is German for “cutlet” and is typically made with veal that’s thinly pounded, breaded and fried. 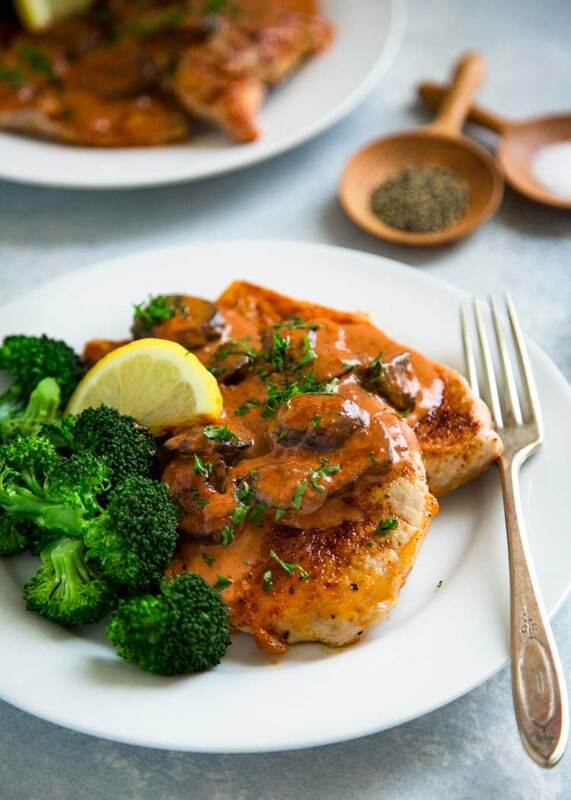 This pork schnitzel version is something that’s a little more readily available and is quickly pan seared and draped in a beautiful sauce punctuated by paprika. I use regular paprika, not the smoky Spanish version. This is a simple dish, but the flavor is something different to spice up the week night dinner doldrums. 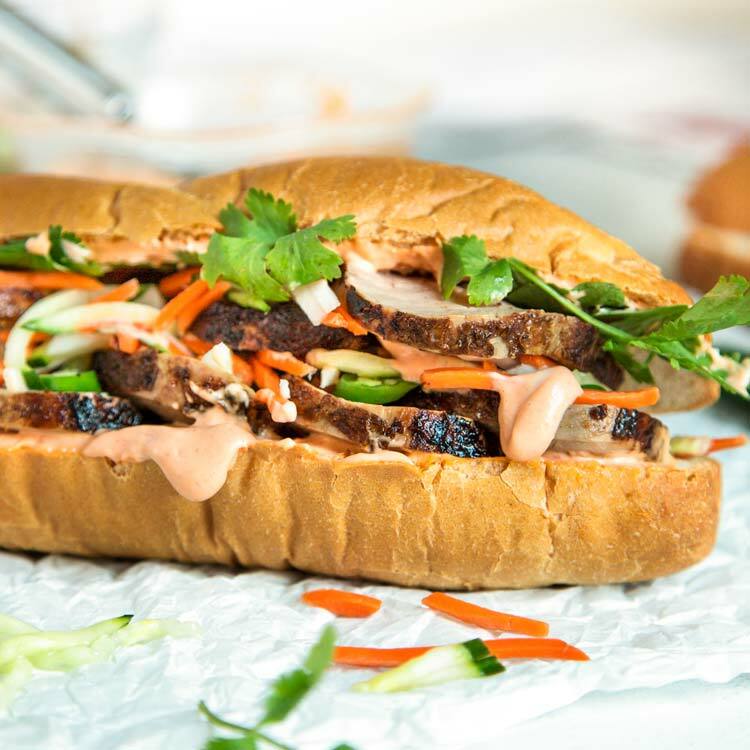 It’s customary to serve the fried version with simply a slice of lemon, the sauce here does plenty for the added flavor and it’s great alongside the steamed vegetables. Paprika is most often used to season and color dishes like hard boiled eggs, rices, stews, soups or Hungarian goulash and stroganoffs. 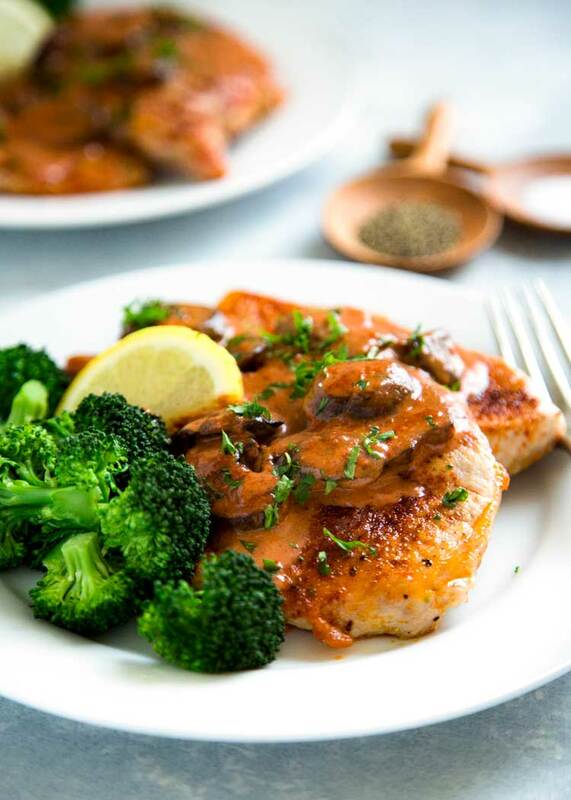 I love the flavor it gives with the pork and in this mushroom sauce. Savory and lightly spiced, I hope you give this Paprika Pork Schnitzel a try. Speaking of Eastern European dishes, you might like my Beefed Up Beef Stroganoff or a pepped up Harissa Beef Stroganoff version. Enjoy! 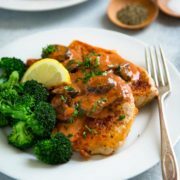 Paprika Pork Schnitzel, not overly spicy, but packed with flavor, this pork loin gets pan seared and sauced with a paprika cream that is beyond tasty. 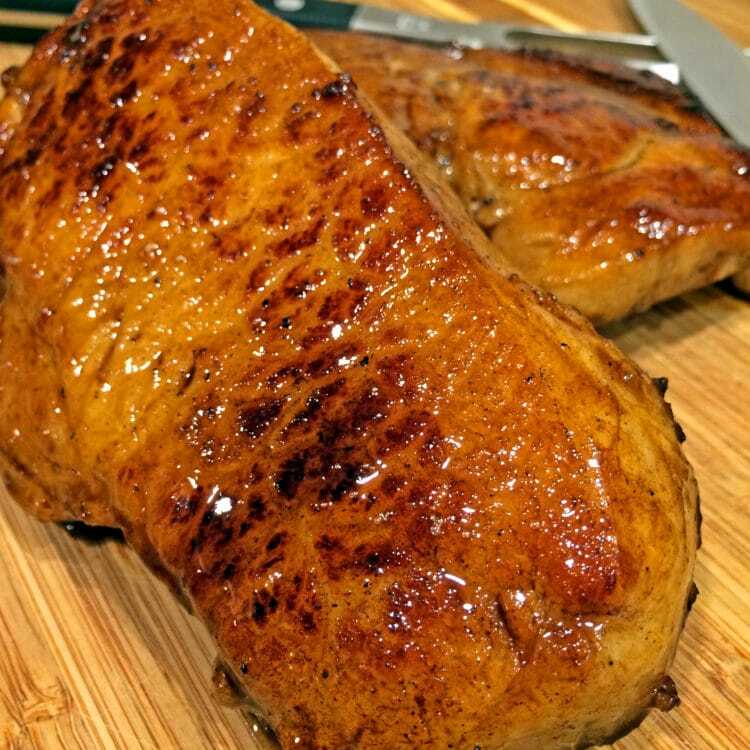 Trim any fat from the pork cutlets to prevent any curling when pan searing. 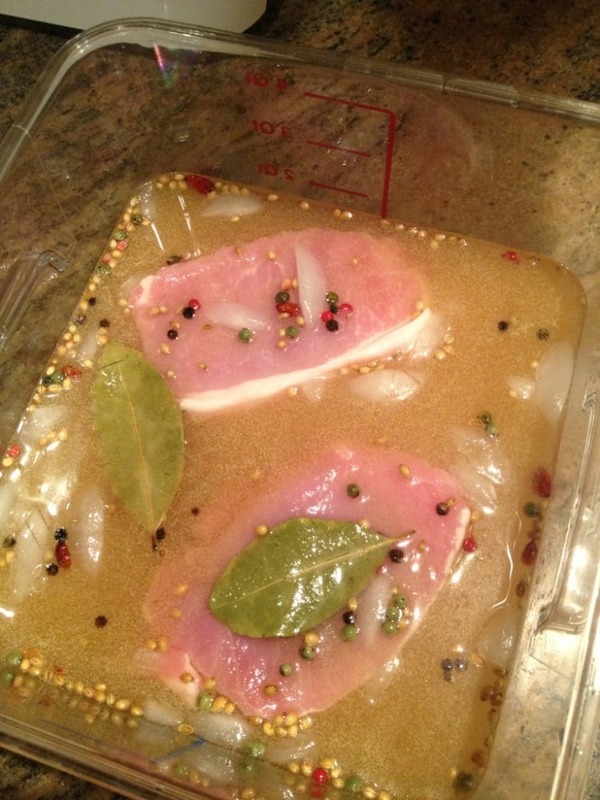 Gently pound the pork loin cutlets between plastic wrap to get thinner and tenderize. Season both sides with salt, pepper and 1 teaspoon paprika. Dust with the flour to coat both sides. Set aside. In a skillet over medium-high heat add the oil. 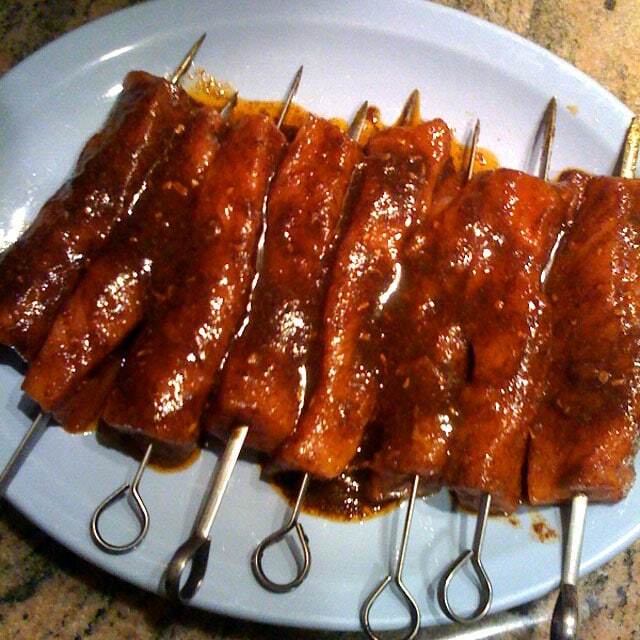 After a minute add the seasoned pork loin cutlets and quickly brown on both sides, about 2 minutes each side. Remove and set aside on a plate. Add the sliced mushrooms to the skillet and cook for a minute. Add the remaining teaspoon of paprika and stir to coat the mushrooms. Add the beef stock, stirring to scrape up and cooked bits in the pan and reduce liquid by half. Add the cream and cook for 2 minutes on low. 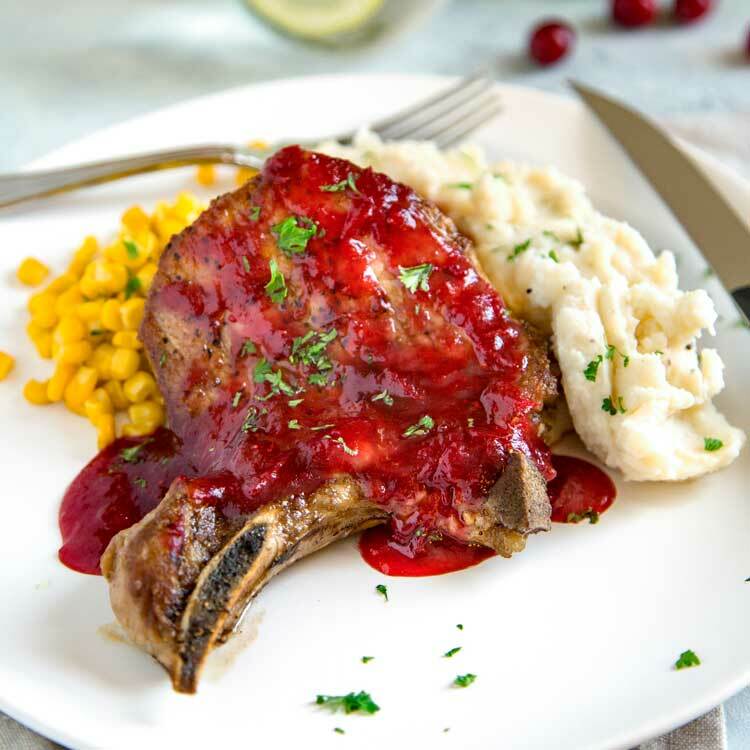 Add the pork cutlets and accumulated juices back to the pan and turn to coat with reduced sauce. Serve with chopped parsley on top. 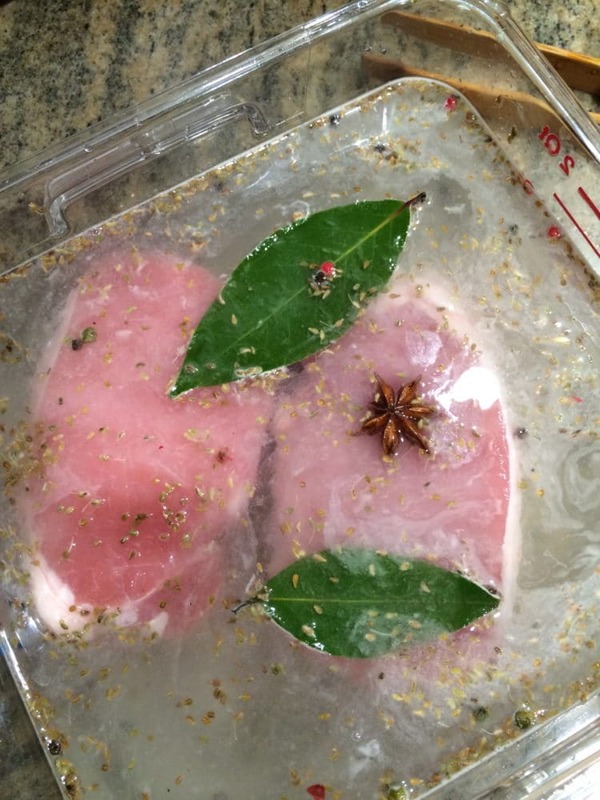 Trim any fat from the pork cutlets to prevent any curling when pan searing. 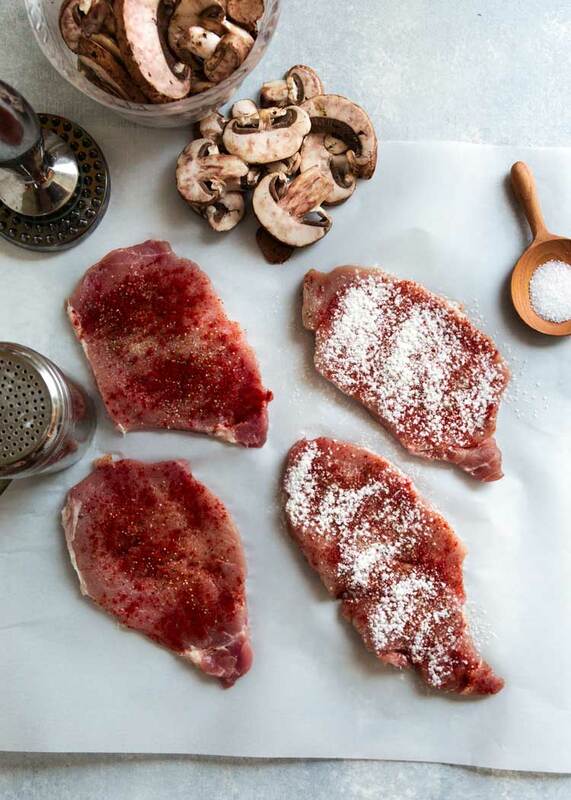 Pound the 1/2 inch thick pork loin cutlets to tenderize, you should have at least 4 cutlets, 2 per person. I have to say that I’ve never thought of making paprika the main event in a sauce. I’ve got to try it! I think I only have smoked paprika – would you recommend plain paprika only for this? I’ve done it with both and thought the smoked version somewhat took over and was a bit much. Give it a try though, it’s just my own preference! I am loving this cutlet! I love paprika and this combo sounds perfect to me!! Hi Kevin. This dish sounds lovely; I am a big fan of paprika (and smoked paprika). For me a small side of buttered noddles would be nice with these. Pork is always available, but veal is rarely. YES! So good. Thanks for stopping by Brian. Hopefully you guys are all safe and warm with that crazy snow back East. Simple CAN be delicious if balanced with flavor right? Plus using the loin allows for no cutting around bone like in a chop, super tender and the paprika sauce is spot on! Cheers Dawn! That sauce looks to die for. 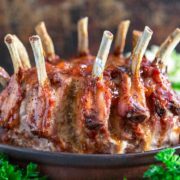 I know this would be a hit at my house – the kids all love pork especially when smothered in a rich sauce like this one! Thanks Karen, plus the pork loin is so tender. This always puts a smile on my face!